Arriving Aug. 15… or now. 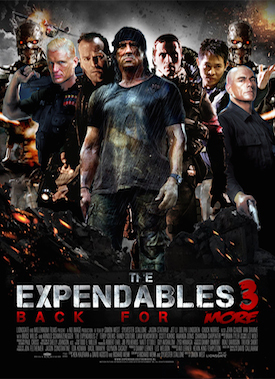 The devotion of young men who love action movies and Sylvester Stallone combined with that demographic’s ability to torrent video content quickly and easily is providing quite a headache for Lionsgate, the distributor of the upcoming The Expendables 3, after a reportedly near DVD-quality copy of the movie leaked online earlier this week. What seems to be a screener copy of the movie has already been downloaded over 100,000 times using BitTorrent alone, reports Torrent Freak (by way of The Verge), after first appearing online late Wednesday sometime. The movie doesn’t even hit theaters until Aug. 15, which means if Lionsgate can’t put a lid on this thing now, it likely won’t do that well at the box office. After all, why pay for Stallone and pals like Harrison Ford Arnold Schwarzenegger, Mel Gibson, Wesley Snipes, Jason Statham and Jet Li (basically anyone who’s been in an action movie in the last 100 years) when you can get them in your living room for free? Especially if the movie’s quality is better than what you get from a shaky cellphone camera in a theater. Well, because piracy is illegal, and Lionsgate could potentially try to go after anyone who downloads a leaked copy. We’ve reached out to Lionsgate to see if the distributor has any plans to seek legal action, and whether or not it’s taking actions to seal this leak up before it goes too far.